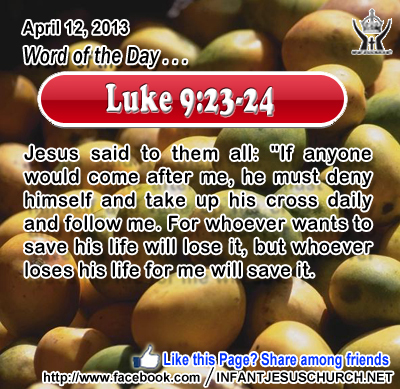 Luke 9:23-24: Jesus said to them all: "If anyone would come after me, he must deny himself and take up his cross daily and follow me. For whoever wants to save his life will lose it, but whoever loses his life for me will save it. Heavenly Father, Master and Maker of all that lives and breathes, take our life and every breath and use it for your glory. May our words and actions this day be pleasing to you. Through Infant Jesus we offer you this prayer and praise. Amen. 16When evening came, his disciples went down to the sea, 17 got into a boat, and started across the sea to Caper'na-um. It was now dark, and Jesus had not yet come to them. 18The sea rose because a strong wind was blowing. 19 When they had rowed about three or four miles, they saw Jesus walking on the sea and drawing near to the boat. They were frightened, 20 but he said to them, "It is I; do not be afraid." 21 Then they were glad to take him into the boat, and immediately the boat was at the land to which they were going. When John recounted the sight of the apostles being alone at sea in a storm he described the condition as “dark”. It was dark not only physically although spiritually as well. While they were experienced fishermen, they were afraid for their lives. The Lord’s sudden presence – and his mystical ability to walk towards them on top of the uneven waves of the sea – only made them more fearful! John says they were frightened. And Jesus had to calm them with a comforting command: “Do not be afraid since I am here with you!” Loving Jesus, may we never doubt your saving help and your watchful presence in our life, especially in times of trouble. Fortify our faith with courage and give us enduring hope that we may never waver in our trust in you.